Full spectrum which provides plants Veg and flower all stages with everything they need in the natural sunlight. Usually used in greenhouse, plant factory, garden, farm, potted plants etc. Aluminum made: compact, durable and helps release heat quickly. Design with daisy chain, connectable to a second one to enlarge coverage. 60° reflector cup design: enables the light distribute more evenly on plants and more concentrated. Can work with a timer. 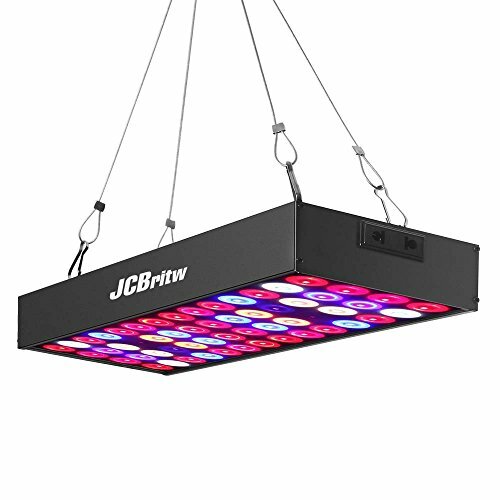 Search: JCBritw Timer to get 20% of the time buy together with the light. - Do not look directly at the LED bulbs when the light is on. - This light includes IR (Infrared) and UV LEDs which look dim, they are not faulty LEDs. - Do not use it close to the hot or heat source, keep it far away from the corrosive gas. - Max using hours: 18 per day. Carefully designed with Daisy Chain, connectable to another unit to enlarge coverage. Separate power control. More freedom in adjusting coverage and save energy. Note: the light is very bright,please don't stare at it directly, suggest wearing a UV glasses to protect eyes.12 months warranty, 30 days satisfaction or return guarantee with friendly customer support. If you have any questions about this product by JCBritw, contact us by completing and submitting the form below. If you are looking for a specif part number, please include it with your message.